Prime Minister Binyamin Netanyahu issued a statement to the international media Thursday afternoon, in which he said Israel would continue to do its best to avoid civilian casualties on the enemy side, despite the fact that the enemy is targeting Israeli civilians and hiding behind its own. He also thanked world leaders including U.S. President Barack Obama for "understanding" Israel's right to defend itself. Expressing regret for the victims on both sides of the conflict, White House spokesman Jay Carney said Thursday there was "no justification" for the violence on the part of Hamas, saying it "does nothing to help the Palestinians." Carney's statement, given to reporters aboard Air Force One as it carried the president to New York, followed a telephone conversation the night before between Obama and Israeli Prime Minister Binyamin Netanyahu. Obama called Netanyahu to "make every effort to avoid civilian casualties," while stressing Israel's right to defend itself from Hamas' attacks, the White House said. The two leaders agreed that Hamas needed to stop attacks on Israel to "allow the situation to de-escalate," the statement continued, putting the blame for the outbreak of violence squarely in the hands of the Islamist movement. The way the IDF operation unfolds may depend on the number of civilian casualties caused to Hamas and its ability to expoit that in order to create pressure on Israel to stop punishing it militarily. This pressure has proven highly effective in the past, especially given the Israeli press's tendency to highlight casualties on the enemy side, thus providing grist for the anti-Zionist mill. In the past, emphasizing enemy civilian casualties acted to weaken national resolve to go on fighting. Listening to Israeli citizen's talking on the radio,however, the impression given is that they want to destroy the ability of Gazans to launch rockets at whatever price. When a broadcaster mentioned that Gazan's are not all Hamas terrorists, the retort of the person interviewed was that the Gazans elected Hamas in democratic elections and knew exactly what they were doing. Others called to turn off the electricity in Gaza. "In recent days and weeks, Hamas and the other terrorist organizations in Gaza have made normal life impossible for over one million Israelis," he said. "No government would tolerate a situation where nearly a fifth of its people live under a constant barrage of rockets and missile fire, and Israel will not tolerate this situation. This is why my government has instructed the Israeli Defense Forces to conduct surgical strikes against the terrorist infrastructure in Gaza. "And this is why Israel will continue to take whatever action is necessary to defend our people. "I want to remind you that seven years ago, Israel withdrew from every square inch of Gaza. Now Hamas, they took over the areas we vacated. What did it do? Rather than build a better future for the residents of Gaza, the Hamas leadership, backed by Iran, turned Gaza into a terrorist stronghold. They fired thousand of rockets at our cities, at our towns, at our civilians, at our children. They've smuggled thousands of rockets and missiles into Gaza, and they deliberately place these rockets and missiles in civilian areas: in homes, in schools, near hospitals. This year alone, they fired over one thousand rockets and missiles at Israel, including close to 200 rockets in the last 24 hours. "I'm stressing this because it's important to understand one simple point. There is no moral symmetry; there is no moral equivalence, between Israel and the terrorist organizations in Gaza. The terrorists are committing a double war crime. They fire at Israeli civilians, and they hide behind Palestinian civilians. And by contrast, Israel takes every measure to avoid civilian casualties. 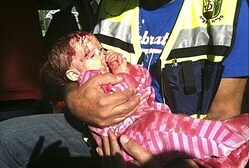 I saw today a picture of a bleeding Israeli baby. This picture says it all: Hamas deliberately targets our children, and they deliberately place their rockets next to their children. Despite this reality, and it's a very difficult reality, Israel will continue to do everything in its power to avoid civilian casualties. "I have to say that from my talks with world leaders, I have the clear understanding that they have a clear understanding of this. Yesterday I spoke to President Obama and I briefed him on Israel's operations. I want to express my appreciation once again to President Obama for his unequivocal clear sided support for Israel's right to defend itself. I also want to express my appreciation to the other world leaders I've had a chance to speak to in the last 24 hours: to President Hollande of France, to UN Secretary Ban Ki-Moon, to EU Foreign Minister Catherine Ashton and to Quartet representative Tony Blair. I want to thank them for their understanding of Israel's need to defend itself, and Israel's right to defend itself. "In the past 24 hours Israel has made it clear that it will not tolerate rocket and missile attacks on its civilians. I hope that Hamas and the other terror organizations in Gaza got the message. If not, Israel is prepared to take whatever action is necessary to defend our people."